We are big fans of the 2019 Toyota Tacoma TRD Pro. 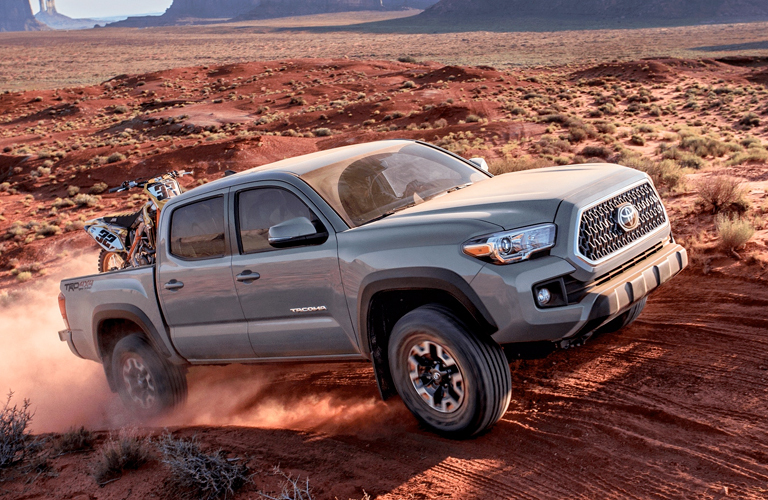 The Tacoma itself is a force to be reckoned with, and a great off-road vehicle, but the TRD Pro adds even more capabilities and off-road features. Today, we are going to give you the list of extra features on the TRD Pro. Then we will go into more details on certain features. Stay with us to learn about the 2019 Toyota Tacoma TRD Pro features and exterior design. Here we have the list of features that make up the TRD Pro. You can see that they all serve an important function off the road. Furthermore, they add style to your 2019 Toyota Tacoma vehicle’s exterior. When you drive a big truck like the 2019 Toyota Tacoma, it is bound to throw a little dirt or dust into the air. You don’t want that dust getting in your engine though, and that is where the TRD Pro Desert Air Intake swoops in to help. This feature perches high on your vehicle to draw in cleaner air for your engine. Your adventure often takes you off the beaten path, and that is where things start to get rockier. Some vehicles can’t handle it, but the 2019 Toyota Tacoma is designed to take a difficult road. The TRD-tuned FOX ® Internal Bypass shocks give the Tacoma more ground clearance and maximum damping to keep your ride smooth. This entry was posted on Sunday, February 10th, 2019 at 5:17 pm	and is filed under Toyota Tacoma. You can follow any responses to this entry through the RSS 2.0 feed. You can leave a response, or trackback from your own site.